At Inverglen Guest House we like to bring you a variety of great offers and rewards. Whether you are a returning guest, a social media follower or a newsletter subscriber we will have an offer especially for you. Of course, our most generous offers are exclusively for returning guests as we truly appreciate your loyalty, but to be fair the deals for the rest of you aren’t too shabby either. If you have stayed with us in the past you can qualify for a generous Discount on future stays*. What better excuse to come back and stay at our Inverness bed and Breakfast. If you have stayed with us before you may already have the discount code, but if not then just drop us an email and we will email you the code so you can use it for your next online booking. *All guests who have stayed with us from March 2012 onwards can claim the discount code. The code has no expiry date but can be withdrawn at any time. If you haven’t stayed with us before you can still get a discount by subscribing to our newsletter. You will gain access to various discounts (albeit not quite as good as our returning customers enjoy). To join just enter your email address in the box below and then click on the Subscribe button. We operate a double opt-in process so you will get an email that requires you to confirm that you actually want to subscribe to the list. We appreciate that it makes the sign-up process a little more onerous, but feel this extra protection is in your best interests. Once your sign-up is completed, you will receive a promotion code that will entitle you to a discount on your next booking at Inverglen Guest House*. Please note that you can unsubscribe from our newsletter at any time and we aim to send no more than 12 newsletters a year. *The details of the current discount will be advised at the time of joining the newsletter. Please note that the amount of discount and the terms of the discount can and do change from time to time, so the terms pertaining at the time of joining our mailing list may not be valid at a later date. All changes to discount terms will be notified in advance via our newsletter. We are active on social media and regularly post offers on our page and to several groups related to Scottish travel. If you follow us on Facebook you will have the best chance of seeing these offers. How many times can a code be used? – A code can be used as many times as you like However, all codes have an expiry date and may have other restrictions that limit when they apply. As long as the code is valid, the discount will be applied and advised to you before the booking is complete. Is there a minimum stay required? – Discounts codes may have a minimum stay requirement, but from time to time we may make codes valid for 1-night stays. Subscribers to our Newsletter will always be notified of new offers and codes. Withdrawal of a Promo/Discount Code – Promo/Discount Codes can be withdrawn at any time without notice. 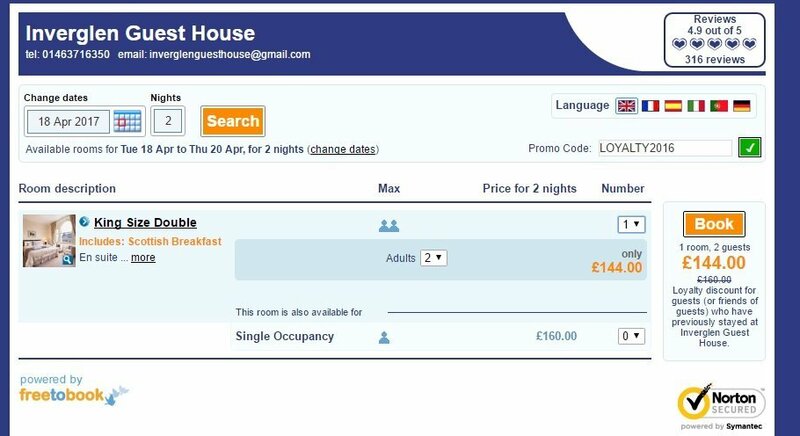 However, once a booking is made the discount will be honoured as long as there are no changes to the dates of the stay or other booking details. Can I use the Promo/Discount code on bookings already made? – Unfortunately, the Prom/Discount code can only be used at the time of the original booking, however, if you let us know that you have missed out on using the code, then we will gladly offer you a 50% discount on any photographs or greetings cards that you buy from us whilst staying. This offer is limited to items that are in stock and must be paid for in cash. The code below is only an example and will not work. To get the latest code you will either need to sign up for our newsletter (see subscription box above) or if you are a previous customer just drop us an email and we will send you your code.